Trex company launched its line of composite wood alternative decking products more than a decade ago to rave reviews and revolutionized an industry. Now it seems more people are becoming dissatisfied with the longevity and quality of Trex products. So much so, that they have agreed to settle two large class action lawsuits. 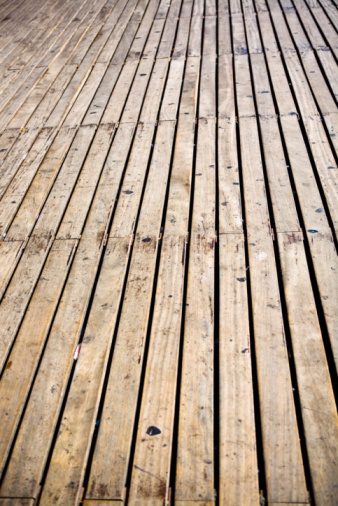 So, what are the problems with Trex decking, and what can you do about them? credit: "Emmy's Feet" is Copyrighted by Flickr user: Monroe's Dragonfly (Rachel Monroe) under the Creative Commons Attribution license. Trex, the way outdoor living should be, or is it? Many Trex deck owners have complained of flaking, deterioration and even in extreme cases virtual disintegration of their Trex decks. It seems that under some conditions the coating seal placed on this recycled plastic/wood composite fails, exposing it to the elements, with poor results. Replacing severely damaged boards seems to be the only remedy. Many Trex products have a simulated wood grain texture which can gather debris and moisture, resulting in surface mildew and mold. This is common in wood decks as well and can be reversed with a deck brightener product such as Corte Clean. Visit your home center paint department and ask for deck brightener. These products contain bleach that will brighten your deck and kill the mold spores. Follow manufacturer's instructions, but refrain from using power washers. Chalk lines are typically used in construction to mark straight lines. Any chalk lines and other marks that do not dust off will be permanent, but may be lightened with acetone, which is available in the paint department of any hardware store or in your medicine cabinet as nail polish remover. Apply a small amount with a soft cloth and rub. Rinse area with water. A chemical called tannin carries the color in most leaves and wood and can leach into your deck causing discolorations that may fade with time. A thorough cleaning with a mop and gentle detergent, such as dish soap, may help remove residual grime and lighten the stain. Removing leaves and debris with a broom or leaf blower frequently is the best preventive measure. Sanding is not recommended for Trex decking products. Unlike wood and noncomposite polymers, Trex has layers, including a harder outer coat that provides its resistance to the elements. Sanding destroys this and causes odd discoloration and markings in the surface that are irreversible. Pressure washing is another no-no. While great for driveways, wooden decks and siding, 1500 psi pressure washers will destroy the outer coating of Trex composite decking, possibly voiding your warranty. A simple garden hose with a lower pressure fitting, coupled with detergent and a mop for tough spots, is your best bet for cleaning Trex deck. What Will Get Mud Stains off of a Stained Deck?